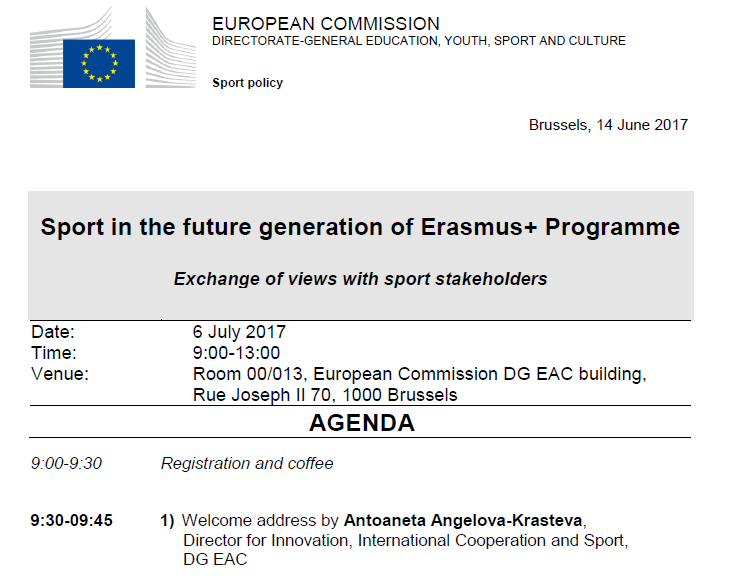 On the 6 July, the Sport Unit of the European Commission organised a consultative meeting with sport stakeholders in Brussels. The meeting proved to be an interesting format and timely initiative by the Sport Unit. Their wish was to gather the views of stakeholders ahead of the meeting of the Sports Directors of the Member States’ Ministries (Tallinn, 11-12 July) during which they will discuss the priorities and place of sport in the next generation of Erasmus+. 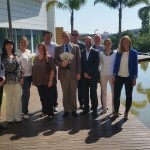 Interestingly the meeting gathered the Sport Unit but also the EACEA (the Funding Agency responsible for delivering the programme) and representatives from the Member States (Luxemburg, Belgium Flemish part, Bulgaria, Estonia and France) as well as representative from the EOC-EU Office, ENGSO, ISCA, StreetfootballWorld, EuropeActive, FESI and the Deutsche SportHochschule. EOSE was represented by Carole Ponchon as PR and Project Manager, who shared the feedback and ideas gathered during the last year as part of the EOSE consultative work with various stakeholders to be able to channel their concerns and opinions into the EU policy making process. The following views and ideas were expressed by stakeholders (including EOSE) during the meeting. The overall feedback was quite positive on Erasmus+ implementation so far, in particular based on its ability to be flexible in its priorities (“skills”) and rules (“unit cost”) thought it was mentioned that the “Small Collaborative Partnership” process should be revised and made easier. As for the future, it was clearly expressed that it will be crucial to safeguard a Sport Chapter in the next generation of Erasmus+. Interestingly there was a consensus among the stakeholders as regard the need to provide more support to learning mobility in the sector (an EOSE priority too). The need for a quality assurance approach was also widely shared and expressed. 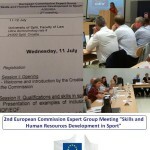 In particular, it was suggested that it will be crucial to build upon the results and recommendations from the first generation of Erasmus+ Sport Chapter and that therefore the focus could be on CONCRETE PROJECTS that show how the various recommendations from these projects can be implemented in reality. Last but not least it was also agreed that the distinction between “Small Collaborative” and “Collaborative partnership” should be kept and that the focus should be on the transfer of knowledge (i.e. process) for the small collaborative partnerships while the collaborative partnerships should seek to concentrate on new and concrete and innovative product development with the inclusion of the possibility to have a few bigger projects in terms of budget and timescale to allow for testing of the outcomes and upscaling of the sector (as it is done in the health sector for example). EOSE in particular strongly advocated the need for better integration of sport in the other budget lines of Erasmus+ and other funding programmes. Indeed, the experience, in particular with the T2MIS project on learning mobility, has demonstrated the need for the sport sector to be recognised as an eligible and relevant applicant or partner in these other programmes. 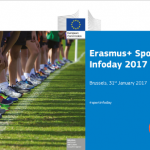 A concrete action could be set with the training of the Erasmus+ National Agency which will be made aware about the potential of the sport sector to contribute to other policy priorities as well as the meaning and main challenges/realities of the sport sector. This could be completed with a support to the creation of National Contact point for the sport sector in all National Agencies able to channel them towards the various opportunities ahead. Last but not least, EOSE also pointed out a potential solution for the rising number of projects selected and the limited resource of the EACEA to monitor them all. It might be of interest to offer some support to successful grassroots organisations and new applicants with a “Mentoring programme” with a pool of experienced and recognised organisations in order to facilitate the transfer of skills, the upscaling of small projects and organisations and unify the sector. The mentor organisation will be paid for by the project to provide advice and possibly external evaluation.